Can I Afford A Collie? Dixie is doing great– in good health and she is a aging gracefully—isn’t interested in jumping up on the couch, but still loves to play bark and chase with the backyard squirrels. A neighborhood Pomeranian was abandoned several years ago and after we “took her in” quickly adopted Dixie as her best friend. She evidently had been severely mistreated and took some time to learn to trust us…with Dixie’s help, she now enjoys family life. The “girls”bring that extra dimension of love that only can be in their hearts. Hope you and your family have a beautiful Christmas season and a blessed new year. Tarni is doing great, and yes, you spelled her name correctly. As you can see in the pictures, she loves the snow and her brothers. We have a doggie door and the dogs are free to go in and out as they please. She loves playing fetch when it is cold because her brothers do not want to go outside and she gets to play without any interruptions. She loves her brothers and often naps snuggling up with one of them. They have taught her how to (sorta) bay like a hound. This summer we had her in formal obedience classes and she did great. It was also great for her socializing because she had started to become overly protective of her beloved family and we wanted her to learn that we were part of a large community/pack. Since classes she has been great when we are out and about. She is a delight and goofs around daily! In this past year and a half she has completely opened up and embraced her forever pack. Carolyn, I wanted to share what your kindness made possible. It is almost a story made for the movies! No one but God could put Mikey’s story together; from the lady who first picked him up and Kristen (my daughter) who took him in, to staying in a garage most of the day by himself with an occasional walk around the yard to DREAMLAND. A blind border collie! All the individuals and rescue groups I contacted either did not respond or said they did not could not help — AND then you were there! You said you would put him on Petfinder and hopefully someone would adopt him. AFTER ONLY TWO MONTHS there was Jorie; she only looked at Petfinder. 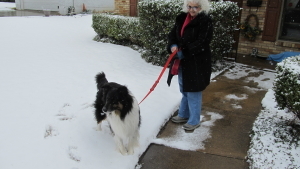 She had never had collies, but did have a BLIND border collie and saw Mikey on your Petfinder list. Miraculous! She and my husband met in Childress, TX (he drove from Colorado) for her to get Mikey; can you image! She has several rescues but says Mikey is her soul mate. Her blind female has taught Mikey how to cool off in the creek and to romp in the meadow to dry off! Carolyn, that is no little story, but there are so many, many verses in the story of the sweet, sweet, blind, border collie from Texas. THANK YOU SO MUCH! 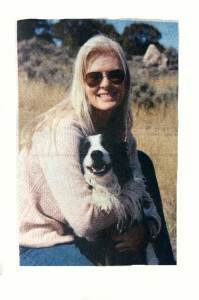 I am including a photo that was published in the Carbondale, CO newspaper at the Blessing of the Animals. Rescue to meet some of the dogs available for adoption. Sadie! We can’t imagine our family without him! Thank you for helping us find Dickson and bring him home nine years ago! 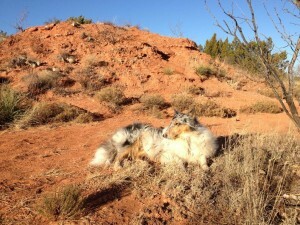 After we lost the 2nd of our two Shelties, we were dogless for several months. Although you know you will love again……it just takes some time. 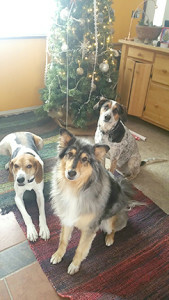 Fall of 2015 had me checking my local animal shelter which led to the Petfinder website and that led to DFW Collie Rescue. I WAS READY FOR A NEW BABY!!! Mark and I filled out our application, passed the home visit and set up an appointment with Miss Carolyn to come for a visit. She took me past the pens, pointing out one that had an appointment with another lady, one that was going through heartworm treatment, one that was being boarded and then BOOM! There he was. Aslan was a big boy, he was quite matted and bloody from a tiff with his brother who had been brought into the shelter with him. Although Aslan was the larger of the brothers, the smaller was the Alpha dog and Aslan was on the losing end of whatever had happened between the siblings. As we walked past, Miss Carolyn said “and I will split these two up”. Because of the mats around his head, he looked like a lion, but with the sweetest face on the planet. Miss Carolyn let me take him out on a lead, he was so gentle and willing and…..perfect. My search was over!!! We had to wait for his vet visit to test for heartworms, which sadly he had, but with good care, medicine and prayers, he made it through. He was still quite handsome under the matted hair. Never underestimate the value of a good blowout. We hadn’t really been seeking to adopt a senior dog, but when you find perfect, don’t pass it up. Aslan has been through obedience classes now looking towards receiving his Good Canine Certificate with plans of becoming a Therapy Dog. Aslan is not the name he was born with, but he has adopted it as well as Mark and me. Aslan is the turkish word for lion and also the main character in one of my favorite books. I have been wanting to send you an update on Newton and I never made the time. He has adapted well to his new family, and has become the king of the house. He loves my best friend Ben and my mom’s friend as well. Newton welcomes them with a wagging tail and a happy smile. Even though sometimes he is a mess, I enjoy every second with Newton! He keeps me safe and is very protective of me, my mom, and grandma. He gets along well with my sisters two German shepherd mix female dogs and loves to try and play with the cat in the house as well. He is keeping me busy, but I love him! Thanks for letting me adopt Newton! My life was filled with taking care of my husband of 57 years who had dementia and was able to keep him home until he passed away last March 2, 2014, at age of 84. I’m 78 years old now. We had moved to Richardson from the ranch July 2, 2013, due to my not being able to take care of him anymore. The Lord has been my strength and Rylie has been there to keep me company with his love and devotion! I imagine most collie lovers (dog lovers) talk to their dogs as they would a friend. I have never tried to train him, but with repetitive saying things the same way (and not realizing I was doing so) he has learned so many things and has been such a joy and love to have. But of course, I just think that he is especially smart!!!!! Lady came into our lives in September 2013. She is the sweetest, quirkiest collie we have ever owned. She fit right in immediately with her big brother Andy. In the evening they sleep as close together as possible until bed time and then pick their favorite spots. She has a funny thing she likes to do with her food. If it is out before evening she pushes the bowl around and hides it and sometimes dumps it out or puts a pillow on top of it. I have never had a collie that likes to “talk” as much as she does. If we go out and come back, she talks to us for about five minutes when we return. She has many funny traits that I’m sure she grew up with and now has shared them with us. I am so glad we got her. It’s like she has always been here. 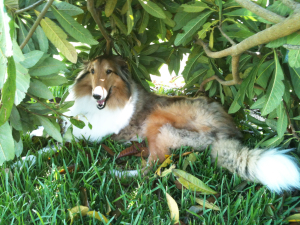 We adopted our sweet girl, Bailey through Carolyn and DFW Collie Rescue in 2009. Bailey has been a wonderful addition to our family, always full of energy and love. She has a sweet spirit and loves to run and play and be with our family. She especially loves being the official Greeter for anyone coming to see us! I can’t say enough nice things about Carolyn. She is just a pleasure to work with and loves all of the fur babies she owns and cares for. We live a good ways from Carolyn but have boarded Bailey with her a few times when we were going to be gone for several days because we know how happy Bailey is with Carolyn. Bailey is a pretty easy girl, but gets nervous at regular kennels. 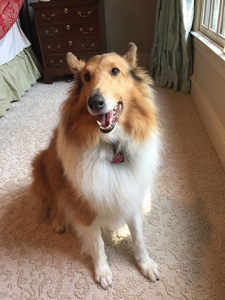 With Carolyn though she feels at home and is very happy.Carolyn, thank you for all that you do in finding homes for collies. Bailey is my third collie and I simply adore the breed. Thank you for finding homes for these special friends. This is our beautiful girl, Asta. 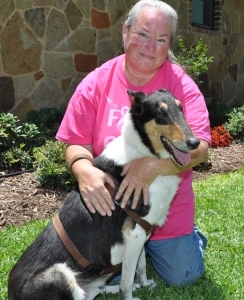 Her “gotcha” date from DFW Collie Rescue was July 20, 2012. 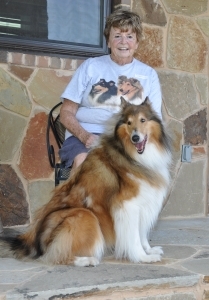 Carolyn Edgmon rescued Asta from a puppy mill when she was about 7 months old. When we adopted her, she was fearful, having to be corralled and put on a leash in order to hold and pet her. She learned the doggie door on her own by watching our other 2 shelties. Each night I would catch her, pull her onto my lap and show her what it is to be loved…petting, massaging and talking to her. It was a slow process, but reaped plenty of reward. She will always be skittish, but now she comes and gives us kisses and is the sweetest girl. 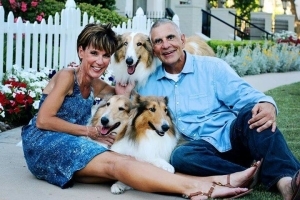 Ron and I adopted our three collies from Carolyn about four years ago. Chloe, Zach and Blaze are best friends and we are all one big happy family. gratitude for the work that she does! I am not sure if I sent you this picture already, but #1756 was in the car ride back from your place. That day changed our lives, and theirs too. I really can’t express how much I love my girl Nala. She is “my” baby!!! She is such a goofy girl (in a good way)! She is intrigued by the silliest things, like picture #3265, she dumps out their toy box and carries the toy box around the house. 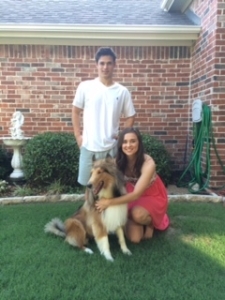 We found a perfect addition to our family with Ricky from DFW Collie Rescue. We had decided to go the adoption route versus a puppy knowing so many dogs are out there. We saw Ricky’s picture on DFW website and knew he was the one. 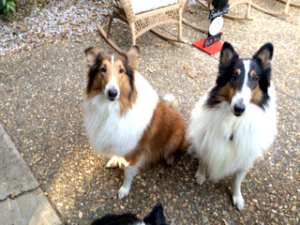 When we pulled up to DFW Rescue all the collies were running around playing we knew we were at the right place. 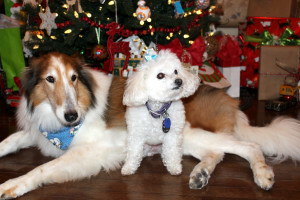 DFW Rescue is a wonderful, beautiful temporary home for these collies that need good homes. Ricky is so sweet and only took about a week to get used to us and his new home. He was house broken and loves all the neighborhood kids. 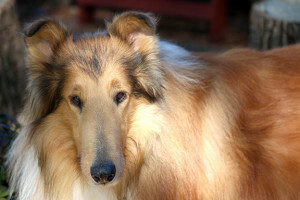 If you are looking for a collie keep looking at DFW Collie Rescue and see what they have then go visit. It will be worth your time. — The Nollman Family and Ricky Bobby! Czar (White with Sable), was our first – a collie dumped on us and a true hero of mine. He never allowed a drunk to come up our driveway (lived near town – and happened more than once). He chased off a steer that was trying to get me down in a small corral before my husband or friend could get to me. 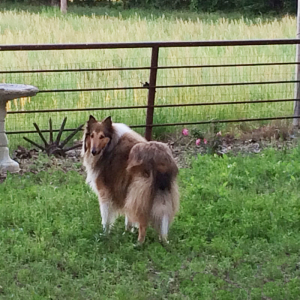 He kept the neighbor’s sheep and goats off of our property with no “herding” training. He never hurt anything – not even a baby cottontail he found in the pasture and brought to me. The first time he was around children he tried to stop my brother from picking up the sleeping girls – he had decided they were his girls and their Dad had no right to remove them from his protection. 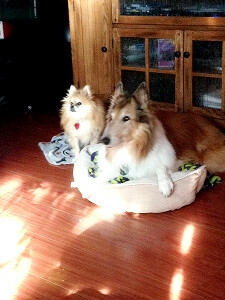 Spinner (Pure for Sable & White), was the first registered collie from you – a sweeter friend has never existed. He was a gentle soul and even the wild barn cat knew Spinner was a special friend. He introduced me to the pleasure of having a “trained” dog as opposed to just a dog. Verbal commands were only needed once. He always wanted to please! He welcomed many nieces, nephews and Boy Scouts to our farm. He would heel and sit for every single child and they were always impressed that he would obey them! He loved to go into the blackberry thickets to feed on his favorite fruit. We always had to carefully untangle him every single time since his thick feathers would get tangled in the thorns and hold him tight. 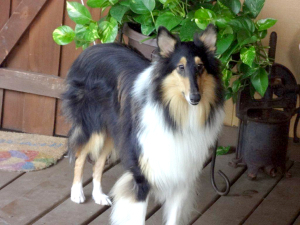 Zegan (Tri-colored), another registered collie, came from you and the shyest of all our pets. But he was also the greatest guard dog since ANY new sound (strange car) driving up our driveway sent him flying into the bedroom to hide. This saved me from having to tell him to hush and let me handle the visitor. Zegan was a perfect gentleman while on lead – never met a stranger and was very patient with the elderly. Even if they patted his head to hard, he would squint his eyes and tolerate the patting, when he much preferred the stroking of his belly. Pinto (Mahogany & White), came into our life next and he was the World’s Champion “People Trainer”. He started off teaching my husband to pass his companion people course (Pinto knew everything – Russell needed the training). He visited children, the elderly, wore costumes and did everything any person could ask – except suffer separation from his family or a thunder storm without major protest. We never could convince him that the “Thunder Gods” were NOT trying to break into his house and he should not try to “kill” the “Thunder Gods”. The separation caused him to get really angry and the only way we found to deal with it was to leave a cardboard box beside the front door for him to “kill” when we left without him. This also taught us to plan ahead and always have the empty box present AND taught us how to pick up thousands of tiny pieces of cardboard in world record time – otherwise we’d still be cleaning. So yes, Pinto was a great people trainer! Zoe (Short haired White & Sable Collie mix), is the last to complete our family circle. 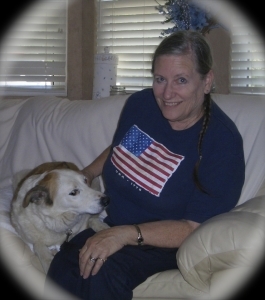 She came to us from you right before Russell was diagnosed with throat cancer. She is an absolute love. She patiently sat with Russell for hours while he waged war with his ugly disease, and allowed me to cry into her shoulder when I couldn’t be strong any longer. He won and she is still a perfect couch potato pardner – excellent for these cool winter days. We just wanted to share how much we enjoy having “Oscar” with us. We adopted him December,2013, so he has been ours for a little over a year. He is easy going, mellow, well mannered, and gentle. He loves children, especially when our grandkids come to visit. He has never had an accident in the house, even at the very beginning. He loves to drop and roll on his back in the yard, like a back massage. He likes to give his paw to you when given love and being caressed. I cannot tell you enough how good he is and how much we have enjoyed him. Thank you Carolyn for taking care of these beautiful and loving animals. Thank you for keeping Oscar for us until the time was right for us to bring him into our family.